This represents the different data sources that feed data into the data warehouse. The data source can be of any format -- plain text file, relational database, other types of database, Excel file, etc., can all act as a data source. Operations -- such as sales data, HR data, product data, inventory data, marketing data, systems data. Web server logs with user browsing data. Third-party data, such as census data, demographics data, or survey data. All these data sources together form the Data Source Layer. Data gets pulled from the data source into the data warehouse system. There is likely some minimal data cleansing, but there is unlikely any major data transformation. This is where data sits prior to being scrubbed and transformed into a data warehouse / data mart. Having one common area makes it easier for subsequent data processing / integration. This is where data gains its "intelligence", as logic is applied to transform the data from a transactional nature to an analytical nature. This layer is also where data cleansing happens. The ETL design phase is often the most time-consuming phase in a data warehousing project, and an ETL tool is often used in this layer. This is where the transformed and cleansed data sit. Based on scope and functionality, 3 types of entities can be found here: data warehouse, data mart, and operational data store (ODS). In any given system, you may have just one of the three, two of the three, or all three types. This is where business rules are stored. Business rules stored here do not affect the underlying data transformation rules, but do affect what the report looks like. This refers to the information that reaches the users. This can be in a form of a tabular / graphical report in a browser, an emailed report that gets automatically generated and sent everyday, or an alert that warns users of exceptions, among others. Usually an OLAP tool and/or a reporting tool is used in this layer. This is where information about the data stored in the data warehouse system is stored. A logical data model would be an example of something that's in the metadata layer. A metadata tool is often used to manage metadata. This layer includes information on how the data warehouse system operates, such as ETL job status, system performance, and user access history. Several concepts are of particular importance to data warehousing. They are discussed in detail in this section. 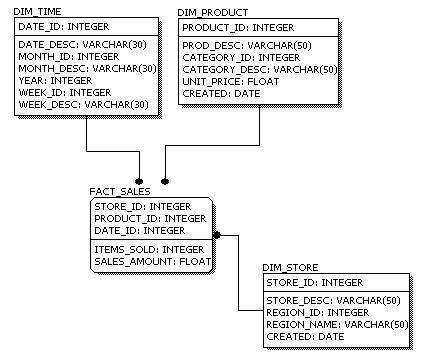 Dimensional Data Model: Dimensional data model is commonly used in data warehousing systems. 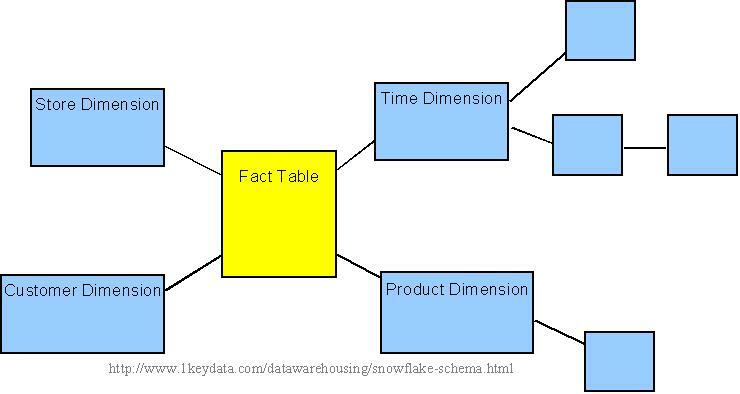 This section describes this modeling technique, and the two common schema types, star schema and snowflake schema. Slowly Changing Dimension: This is a common issue facing data warehousing practioners. This section explains the problem, and describes the three ways of handling this problem with examples. 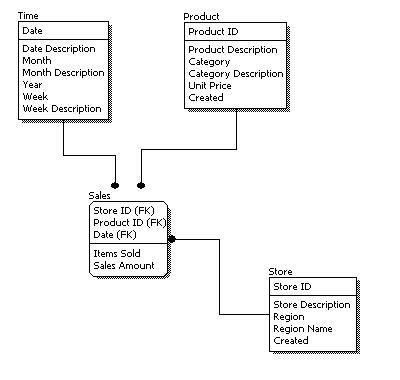 Conceptual Data Model: What is a conceptual data model, its features, and an example of this type of data model. 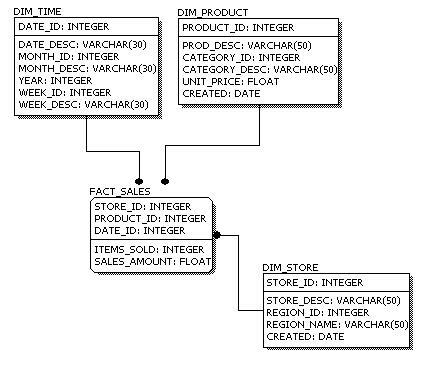 Logical Data Model: What is a logical data model, its features, and an example of this type of data model. 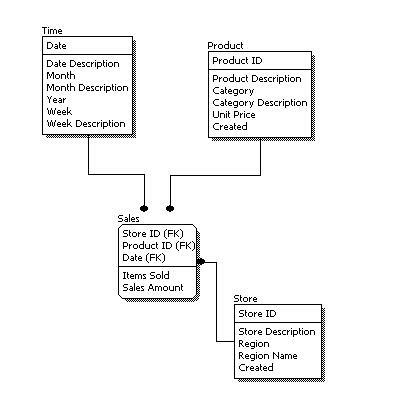 Physical Data Model: What is a physical data model, its features, and an example of this type of data model. Conceptual, Logical, and Physical Data Model: Different levels of abstraction for a data model. This section compares and contrasts the three different types of data models. Data Integrity: What is data integrity and how it is enforced in data warehousing. What is OLAP: Definition of OLAP. MOLAP, ROLAP, and HOLAP: What are these different types of OLAP technology? This section discusses how they are different from the other, and the advantages and disadvantages of each. Bill Inmon vs. Ralph Kimball: These two data warehousing heavyweights have a different view of the role between data warehouse and data mart. Factless Fact Table: A fact table without any fact may sound silly, but there are real life instances when a factless fact table is useful in data warehousing. Junk Dimension: Discusses the concept of a junk dimension: When to use it and why is it useful. Conformed Dimension: Discusses the concept of a conformed dimension: What is it and why is it important. Whether one uses a star or a snowflake largely depends on personal preference and business needs. Personally, I am partial to snowflakes,when there is a business case to analyze the information at that particular level. We will have 4 lookup tables in a snowflake schema: A lookup table for year, a lookup table for month, a lookup table for week, and a lookup table for day. Year is connected to Month, which is then connected to Day. Week is only connected to Day. A sample snowflake schema illustrating the above relationships in the Time Dimension is shown to the right. Determine which dimensions will be included. Determine where along the hierarchy of each dimension the information will be kept. The determining factors usually goes back to the requirements. Determining which dimensions to include is usually a straightforward process, because business processes will often dictate clearly what are the relevant dimensions. For example, in an off-line retail world, the dimensions for a sales fact table are usually time, geography, and product. This list, however, is by no means a complete list for all off-line retailers. A supermarket with a Rewards Card program, where customers provide some personal information in exchange for a rewards card, and the supermarket would offer lower prices for certain items for customers who present a rewards card at checkout, will also have the ability to track the customer dimension. Whether the data warehousing system includes the customer dimension will then be a decision that needs to be made. Determining which part of hierarchy the information is stored along each dimension is not an exact science. This is where user requirement (both stated and possibly future) plays a major role. In the above example, will the supermarket wanting to do analysis along at the hourly level? (i.e., looking at how certain products may sell by different hours of the day.) If so, it makes sense to use 'hour' as the lowest level of granularity in the time dimension. If daily analysis is sufficient, then 'day' can be used as the lowest level of granularity. Since the lower the level of detail, the larger the data amount in the fact table, the granularity exercise is in essence figuring out the sweet spot in the tradeoff between detailed level of analysis and data storage. Note that sometimes the users will not specify certain requirements, but based on the industry knowledge, the data warehousing team may foresee that certain requirements will be forthcoming that may result in the need of additional details. In such cases, it is prudent for the data warehousing team to design the fact table such that lower-level information is included. This will avoid possibly needing to re-design the fact table in the future. On the other hand, trying to anticipate all future requirements is an impossible and hence futile exercise, and the data warehousing team needs to fight the urge of the "dumping the lowest level of detail into the data warehouse" symptom, and only includes what is practically needed. Sometimes this can be more of an art than science, and prior experience will become invaluable here. 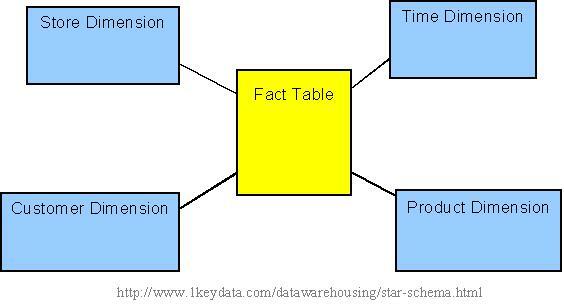 Additive: Additive facts are facts that can be summed up through all of the dimensions in the fact table. The purpose of this table is to record the sales amount for each product in each store on a daily basis. Sales_Amount is the fact. In this case,Sales_Amount is an additive fact, because you can sum up this fact along any of the three dimensions present in the fact table -- date, store, and product. For example, the sum of Sales_Amount for all 7 days in a week represents the total sales amount for that week. The purpose of this table is to record the current balance for each account at the end of each day, as well as the profit margin for each account for each day. Current_Balance and Profit_Margin are the facts. Current_Balance is a semi-additive fact, as it makes sense to add them up for all accounts (what's the total current balance for all accounts in the bank? ), but it does not make sense to add them up through time (adding up all current balances for a given account for each day of the month does not give us any useful information). Profit_Margin is a non-additive fact, for it does not make sense to add them up for the account level or the day level. Cumulative: This type of fact table describes what has happened over a period of time. For example, this fact table may describe the total sales by product by store by day. The facts for this type of fact tables are mostly additive facts. The first example presented here is a cumulative fact table. Snapshot: This type of fact table describes the state of things in a particular instance of time, and usually includes more semi-additive and non-additive facts. The second example presented here is a snapshot fact table. Type 1: The new record replaces the original record. No trace of the old record exists. Type 2: A new record is added into the customer dimension table. Therefore, the customer is treated essentially as two people. Type 3: The original record is modified to reflect the change. We next take a look at each of the scenarios and how the data model and the data looks like for each of them. Finally, we compare and contrast among the three alternatives. In Type 2 Slowly Changing Dimension, a new record is added to the table to represent the new information. Therefore, both the original and the new record will be present. The new record gets its own primary key. Data type for each column is specified. Data types can be different depending on the actual database being used. Below we show the conceptual, logical, and physical versions of a single data model. We can see that the complexity increases from conceptual to logical to physical. This is why we always first start with the conceptual data model (so we understand at high level what are the different entities in our data and how they relate to one another), then move on to the logical data model (so we understand the details of our data without worrying about how they will actually implemented), and finally the physical data model (so we know exactly how to implement our data model in the database of choice). 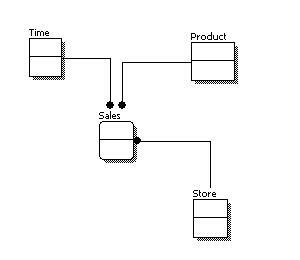 In a data warehousing project, sometimes the conceptual data model and the logical data model are considered as a single deliverable. For people on the business side, the key feature out of the above list is "Multidimensional." In other words, the ability to analyze metrics in different dimensions such as time, geography, gender, product, etc. For example, sales for the company are up. What region is most responsible for this increase? Which store in this region is most responsible for the increase? What particular product category or categories contributed the most to the increase? Answering these types of questions in order means that you are performing an OLAP analysis. Depending on the underlying technology used, OLAP can be broadly divided into two different camps: MOLAP and ROLAP. A discussion of the different OLAP types can be found in the MOLAP, ROLAP, and HOLAP section. In the OLAP world, there are mainly two different types: Multidimensional OLAP (MOLAP) and Relational OLAP (ROLAP). Hybrid OLAP (HOLAP) refers to technologies that combine MOLAP and ROLAP. This is the more traditional way of OLAP analysis. In MOLAP, data is stored in a multidimensional cube. The storage is not in the relational database, but in proprietary formats. Excellent performance: MOLAP cubes are built for fast data retrieval, and are optimal for slicing and dicing operations. This methodology relies on manipulating the data stored in the relational database to give the appearance of traditional OLAP's slicing and dicing functionality. In essence, each action of slicing and dicing is equivalent to adding a "WHERE" clause in the SQL statement. Did you know that you can create short urls with LinkShrink and receive dollars for every visitor to your shortened urls.